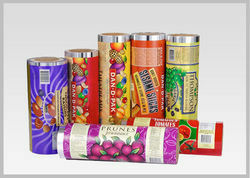 Offering you a complete choice of products which include printed laminated rolls and spices packing printed pouch & rolls. Flexible Laminated Rolls offered by us are extensively used in varied industries for the packaging applications. These are multi-layered bags for which, the resilience and strength are guaranteed. Made up of the high-quality synthetic plastic, the bags do not lose its top-notch quality or become inferior in the long run. Owing to the sturdy construction, the bags have got the ability to withstand intense compression and overload conditions. Moreover, the outer layer of the bag is laminated that thwarts the water or moisture to come inside. We are providing Flexible Laminated Rolls to our patrons in varied sizes and designs.